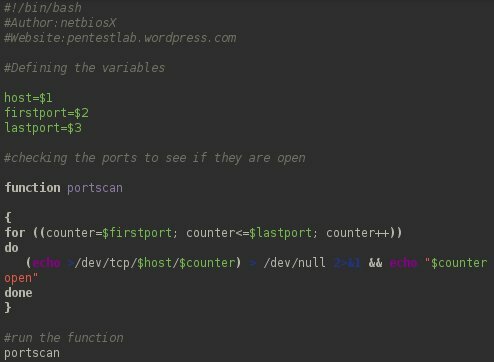 Every penetration tester needs to know how to write code in order to automate a task or to develop a tool that will perform a specific activity that it might be needed in a penetration test.So in this tutorial we will see how we can create simple tcp port scanner in bash.Of course the best tool for this job is Nmap but the scope of this post is to familiarize with bash scripting and to inspire the readers to develop their own tools. The shebang (#!) is used because it will instruct the operating system that what comes next will be the interpreter of the script which in this case is /bin/bash. As an input our port scanner will take an IP (which it will be the IP of the target that we want to scan),the port that we want to scan first which has defined as firstport and the port that we want to scan last (lastport). As we saw creating a port scanner in bash is very easy if we know the basics of this scripting language.The main function of this port scanner is to check only if the tcp ports of a host are open.The user can select from which port the scan will start and in which port it will end.Of course the port scanner can be improved in many ways.For example implementing additional functions like scanning and the UDP ports as well and allowing the user to scan multiple hosts. It should be mentioned that /dev/tcp isn’t enabled on all versions of bash, I know that Debian doesn’t have it enabled out of the box. You are right Robin and many thanks for noticing that.My bad that I forgot to mention it.If any of the readers have problems enabling the /dev/tcp I am happy to create another post to explain the process. Is it normal that this script works when you ping an open port, but it it isn’t open it just waits for an answer?